There are a number of choices available to firms seeking support for their order picking operations. Solutions such as RF scanning, pick to light, and paper picking are used by many firms; but none allow workers to do what they can with a voice-directed solution: pick with optimal levels of productivity and accuracy. Following are some comparisons of the various systems that will be helpful in evaluating voice picking. RF scanning directed picking achieves neither optimal speed nor accuracy. While holding an RF scanning device, pickers have only one hand free. To free their hands to make a pick, workers have to waste time putting the device down and then picking it up again. Some workers try to continue to hold or balance the device against their body as they make the pick. This makes them are more prone to drop and damage the product and or the device. Additionally, not all barcode labels are properly aligned. If there is a crease in the label, RF scanners won’t always read the bar code, resulting in time wasted inputting numbers manually. Finally, the worker must read the relatively small screen of the device to receive their instructions and sometimes enter information via its keypad, so in essence they are picking with electronic paper and pencil. One Vocollect user describes voice picking as “Pick and go, pick and go” . 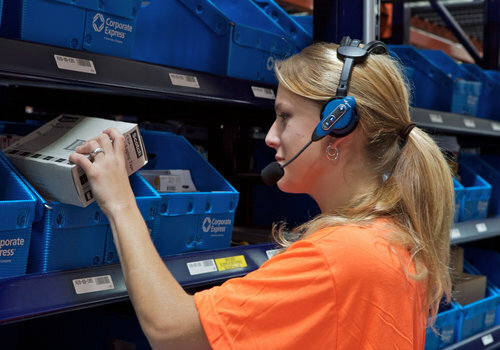 With voice, pickers are able to use two hands, allowing them to select more products at one time at a faster pace. A comparison test between voice picking and RF scanning showed that picking by voice allowed the picker to achieve a 35% increase in speed. With voice, all the wasted time spend interacting with the scanning device is saved, and accuracy is improved because workers are able to always keep their eyes and focus on the product being picked. Pick to light systems require a large initial investment as well as high maintenance costs for the life of the system. Since pick to light systems are tied to physical locations, they are not inherently flexible nor cost effective to scale. Adding new locations requires additional equipment, thereby increasing costs. While picking can be fast for one worker in a zone, total throughput across all zones is typically slower than voice-directed picking operations. And accuracy is typically less than that of voice systems since they don’t require workers to confirm pick quantities. Voice-directed work solutions require little, if any maintenance and are very flexible to accommodate change. Voice picking accommodates growth cost-effectively in that as the number of products and SKUs increase, no additional investment is required. And, with voice, accuracy rates average an industry leading 99.9% or higher. In today’s electronic world, performing nearly any task by paper can seem somewhat obsolete. However, there are still a great number of distribution centers that utilize paper picking due to its low cost. Beyond its low initial costs, however, paper systems do not yield any of the benefits of modern electronic wireless systems that do not require workers to travel back and forth to a desk to retrieve orders or require data entry personnel to update internal systems. Paper picking is inherently the most inaccurate of all methodologies because it relies entirely on the human element. Workers are also slowed by the need to handle and interact with paper and pencil as they pick. And, it is anything but low cost on a day to day basis. According to the Director of Information at Smith Drug, the company was using almost 2-3 cases of paper per day to accommodate their picking needs. Almost every retail grocer in the world transitioned directly from paper to voice because they wanted to improve their accuracy without slowing their workers down. These companies and many others in a great variety of industrial verticals realized that voice was their ultimate solution. Not only did it allow their workers to pick with optimal levels of productivity and accuracy, it also dramatically reduced training times for new and temporary employees and increased overall worker satisfaction. Engage a consultative and experienced premiere voice total solution provider to find out how much value and ROI a voice picking solution could deliver to your picking operation.